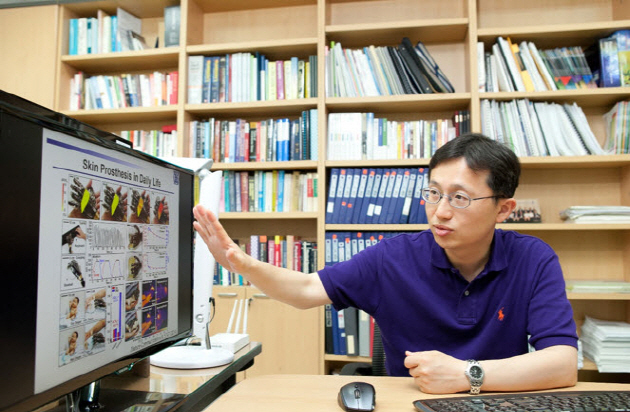 SNU Professor KIM Dae Hyeong (School of Chemical and Biological Engineering) recently developed a"soft cardiac stimulator" that can treat heart failure. In a series of animal experiments, Professor Kim monitored electrical signals flowing through the heart and sent new signals immediately after any problems were detected, which restored cardiac functions to normal conditions. Heart failure occurs when the heart is unable to pump blood to sustain the body. A healthy heart regularly contracts and relaxes its muscles according to electrical signals generated within the body, thereby maintaining blood flow. When blood vessels within the heart are clogged, muscle cells become damaged due to lack of oxygen and nutrients. As a result the heart stops receiving electrical signals, leading to heart failure. Consequences of heart failure can be quite fatal, as 30-40% of patients diagnosed with heart failure die within one year while 60-70% of patients die within five years due to aggravated symptoms or acute strokes. Professor Kim, who is also a researcher at the Institute for Basic Science (IBS) Center for Nanoparticle Research, devised the stimulator mainly out of nano wires and rubber. His research team combined rubber and silver nano wires, which have high electrical conductivity, to create a twisty mesh that gently wraps around a damaged heart that has stopped beating. The theory is that the mesh gives the heart electrical stimulations until it starts beating again. The elastic stimulator can also stretch as the heart expands, so that it does not interfere with cardiac motions. According to Professor Kim, his new device combines the advantages of existing technologies. The existing version of the cardiac stimulator can only affect parts of the heart that it makes direct contact with. Theoretically, such partial stimulation should be sufficient to facilitate the flow of electric current through the entire heart, but in reality this is not the case, as heart failure damages cardiac muscles, a condition which in turn blocks electrical signals. On the other hand, cardiomyoplasty, a surgical procedure in which an elastic net wraps around and thereby strengthens the heart, did not give electrical stimulations. Professor Kim's soft cardiac stimulator performs both functions of transferring electric currents as well as stimulating all parts of the heart. Professor Kim explained that the commercialization of his soft cardiac stimulator would require a minimum of five years of further animal testing and clinical trials. His research results were published online in the Science Translation Medicine journal.